distribution Though reference books show the range of the species to occur statewide (and across most of the Eastern US), NC records fall only in the Piedmont, and a few widely scattered areas in the Coastal Plain. Ranges west to Surry, Iredell, and Mecklenburg counties in the Piedmont; and it ranges east to Gates and Onslow counties in the northern Coastal Plain, but most records fall in the northeastern portion of the Piedmont (which could be a bias in observer coverage). abundance Uncommon in the eastern third of the Piedmont, rare to very uncommon in the central Piedmont, and very rare in the narrow Coastal Plain portion of the range. Possibly just a stray to the eastern Coastal Plain; this is an easily identified and quite large species, so it is not being overlooked in the Coastal Plain. flight The flight occurs during the two months from late April to late June (and sparingly to mid-July), with the peak in the latter half of May. habitat Very small streams and seeps, in wooded/shaded habitats. behavior As with all spiketails, adults often forage long distances from their forested streams. The species is most often seen along wooded trails or roads, perching low to the ground on a twig. 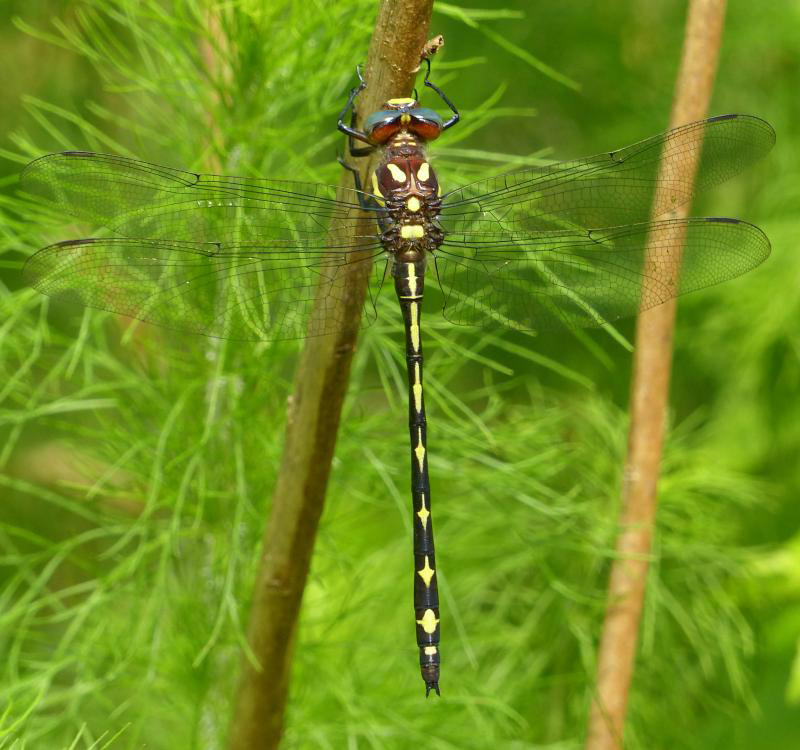 However, unlike other spiketails, it has a habit of flying off high, often over trees, once disturbed. comments This, the largest of our four spiketails in NC, is always a thrill to see. Its dorsal yellow abdominal markings (not paired as in other spiketails) indeed look like arrowheads, rendering it easy to identify. Fortunately, it is not overly scarce in the eastern Piedmont; an active observer there has a reasonable chance to encounter it each year. Conrad Wernett photographed one far to the east of the previously known range in Onslow County, in July 2017. Not only was this far east of the previously known range, but the mid-July date is the latest date known for the species! It is too soon to say if the regular range of this species extends this far to the east, as nearly all records are for the Piedmont and the far western Coastal Plain. Comment: Onslow, 2017-07-20, - Old female found in front yard!